Caramelized pears with ash coated goat cheese and topped with crushed almonds on top of whole grain toast. Crostini is Italian for toast and it sounds nicer than just saying toast. Don’t you just love Italian , it makes even the simplest things sound marvelous :) The goat cheese I am using is one of my favorite types of goat cheese , it it covered in ash. Ash? yes that’s right! Though you do find some cheeses with cow milk that have ash, Ash is most commonly added to goat cheese to help tone down the acidity. 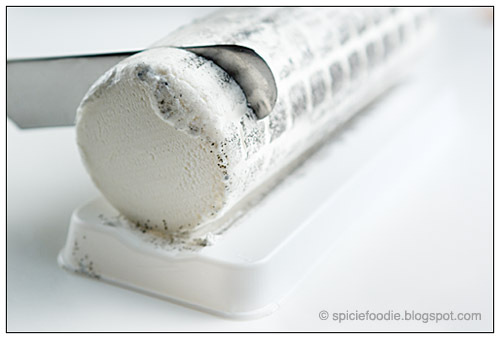 Some cheeses have the ash added on the outside and others have a layer of ash in the center diving two layers. There is nothing to be nervous about when it comes to the ash, it’s flavorless and perfectly safe. All this talk about cheese is making me really miss France. When I lived in Paris my flat was just down the street from our local Fromagerie. Ah a cheese lover’s paradise, even with the horrible smell. Mexicans don’t eat a lot of cheese so for me cheese was something I grew to love. My husband started introducing me to all sorts of cheeses, that I know love. But living in cheese paradise France I quickly felt like I knew nothing about cheese, (Ok I still don’t know that much). Going to the fromagerie was always an adventure to try new cheeses. ( After closing hours if you walked down the street from the shop you could still smell the cheese , hehe). At restaurants we quickly took to loving the assiette du fromage (cheese plate) for dessert. But even just taking a walk down the “cheese isle” in our local Champion grocery store was an exhilarating experience. There were so many different choices of deliciously creamy and wonderfully stinky cheeses, I honestly can’t remember them all. In Prague the choices of local cheeses are somewhat limited and there aren’t any fromageries here. But recently a small gourmet shop opened up in my neighborhood. Of course I had to know what was being sold there, and to my surprise they have FROMAGE!! lots of French cheeses, Dutch , German and Italian varieties. I was thrilled to see the ash coated goat cheese as it was always one of my favorites in Paris. I can’t wait to go back to try some new cheeses, yum. So today I am sharing a simple recipe to use this very versatile cheese, a crostini. 1. Peel the pear and either slice or dice it. In a pan melt a knob of butter, just enough to coat the pan, then add the pears. Stir the pears then add some honey to coat the pear pieces. I used about 1 spoonful, adjust to your liking. Next drizzle a bit of balsamic vinegar and stir the mixture. Sprinkle in a pinch each of salt and black pepper and again stir to combine the mixture. 2. Cook until the pear pieces have become soft and transparent, they will have caramelized. Prepare the bread by toasting then spread some goat cheese on the toast. Top the toast with the cooked pears and spread on a even layer. Sprinkle the almonds and serve. Makes a great light lunch or snack with it’s slightly salty and sweet then a slight crunch from the almonds. Enjoy! I like simple recipes, this looks good Spicie Foodie! This sounds incredible. I love the combination of the pears and the cheese. Definitely bookmarking this one. That piece of cheese looks so good! Interesting combination of flavors! I like the idea of the pears and goats cheese. You speak my language with that goat cheese. This looks fantastic! 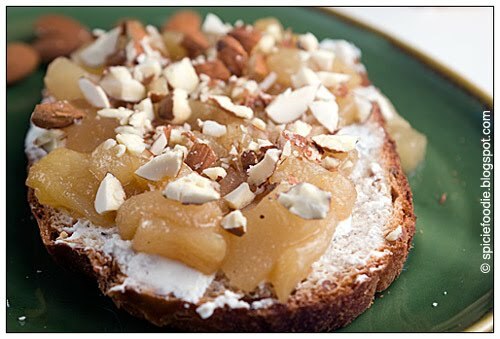 I adore goat cheese, and pears, and almonds, and honey, and even toast! I'd like to recommend my favorite goat cheese (for those in the U.S.) made by Fantome Farms in Wisconsin for this recipe. It too is ash-covered. I used to buy it at the farmer's market on Saturday mornings in Madison. http://www.fantomefarm.com/chevres.htm Thanks for sharing what looks like a scrumptious recipe! I do this in a verrine – pretty similar. Loving the idea as a topping for crostini- so beautiful! Thank you for sharing this recipe. It's a remarkable recipe as usual. I just love this, and I love that goat cheese! @The Housewife- Yes it would be a great appetizer! Apricots sound really good too ,we should try it and see how it goes. Mmm.. what a wonderful appetizer! 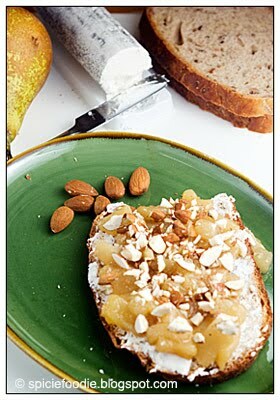 The pairing of pears and goat cheese is excellent and I love the addition of almonds! Very nice goat cheese dish. I like the addition of the almonds. I found your blog through Natasha. Look forward to following your here. @ 5 Star Foodie , Thanks it was fantastic! @ Lazaro Cooks, Welcome to my site and I too look forward to seeing you stopping by. 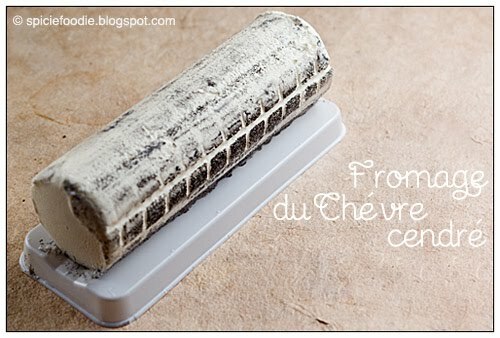 Ash-covered chevre is my all time favourite cheese! 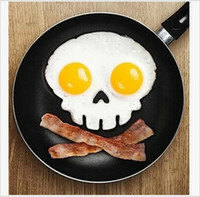 I can just imagine how it would taste with pear and balsamic.. It goes wonderfully with anything sweet and acidic. I used to make thousands of tiny little quinelles of caramelised onion that had been deglazed with sherry vinegar for canape functions and wedding receptions and back then I convinced myself that I would be perfectly happy to never see another goat's cheese ever again but nowadays it's always the first one i go back to! I just prepare and was delicious. Thanks for the recipe! You are welcome Sonia and glad you liked it. Thanks for the great read. Keep it up!